The trial over the Justice Department's lawsuit to block AT&T's purchase of Time Warner, which will reach its conclusion when a judge announces his ruling Tuesday afternoon, is not just about the combination of two massive companies. It is about tectonic shifts in the media and technology industries. It's about how and where we consume content and it's about the data that companies like Netflix, Facebook and Amazon collect on viewing habits and consumer behavior that gives them a leg up over companies like Time Warner and AT&T. The trial is also a landmark for the entire industry, as companies like Disney, Fox and Comcast wait to see how the judge rules before moving ahead with their own mega deals. If AT&T and Time Warner win, it will likely be full steam ahead. But if the ruling falls in the Justice Department's favor, a new era of government scrutiny over these types of mergers could freeze further consolidation in the industry. The lawsuit landed like a bomb when it was filed on Nov. 20, 2017, more than a year after the two companies announced the deal. Government suits of this kind are rare, especially in so-called "vertical" mergers -- that is, the combination of two companies that do not directly compete with one another. Time Warner is a content producer while AT&T is a content distributor via its DirecTV satellite services and mobile phone business. It's like a pipe producer buying the company that creates the material that flows through the pipes. The last time the government sued to stop a "vertical" merger was in the 1970s. The final decision rests entirely on Judge Richard Leon. Leon's ruling will depend on whether he finds that the purchase would violate antitrust laws, which prohibit mergers or acquisitions that within "reasonable probability" are likely to lessen competition. Leon has repeatedly noted the magnitude of the case and its importance "to the future of the industry," and said that he expects his written opinion to be hundreds of pages long. Leon is not limited to ruling "yes" or "no." He can also essentially force a third option, in which he tells AT&T and Time Warner he'd allow the deal to proceed, but only if the companies make certain changes to the transaction. That could involve so-called "behavioral remedies," like requiring AT&T and Time Warner agree to certain conditions that will help determine how they negotiate contracts with distributors. Leon could also impose "structural remedies," like declaring that in order to complete the deal, AT&T could not be a majority owner of Turner, the Time Warner subsidiary that owns CNN. The Justice Department has suggested that Leon force the companies to divest a part of the newly merged entity -- either AT&T's DirecTV satellite subsidiary or the Turner networks -- to ameliorate the antitrust concerns. But the Justice Department offered this option to AT&T and Time Warner before the lawsuit was filed and the companies rejected the idea, saying it would defeat the purpose of the acquisition. Either side can appeal the decision, which would then bring the case to the D.C. Circuit Court of Appeals. If Leon does not rule in the Justice Department's favor, it would likely ask that either Leon or the appeals court issue a stay, forcing AT&T and Time Warner to wait further before completing the deal -- and because June 21 is the deadline for the deal to close, if a stay is issued, the deal as it is currently structured could then fall apart. The Justice Department argued that if it were to own Time Warner, AT&T would reduce competition in three ways: Raising the costs of Time Warner's content to AT&T's rivals, restricting competitors' use of Time Warner's HBO network as a promotional tool, and impeding innovation unilaterally or through coordination with Comcast-NBCUniversal. The DOJ's attorneys spent much of the six-week trial focused on the first allegation. They argued that consumers demand that their cable or satellite providers carry Time Warner's Turner networks, including CNN, TNT and TBS, because of the content they show, like live sports and news. Owning these networks would give AT&T an advantage in negotiations with rival providers, the government argued. AT&T could demand that those rivals start paying more to carry the channels, and if they refuse to do so, AT&T would threaten to walk away because then consumers would switch to AT&T's own DirecTV. That would lead to higher prices overall, which would hurt the competitive market and consumers, the government's attorneys alleged. "If AT&T acquired Time Warner, Turner's leverage would increase because it would have the nation's largest [multichannel video programming distributor] with it in the trenches," the Justice Department's team wrote in its post-trial brief, using the industry term for a cable company. "The alternative to an agreement in every negotiation with a rival [distributor] would be better for the merged firm because without a deal, DirecTV would steal valuable video subscribers away from that rival." The DOJ also argued that AT&T would want to limit its rivals' use of HBO as a promotional tool, like offering it for free to potential customers -- if rivals like Cox and Charter can't use prestige shows like "Game of Thrones" to entice customers to sign up, the government argued, DirecTV can, giving it an advantage. The government also alleges that AT&T would coordinate with the only other vertically integrated media and distribution company, Comcast-NBCUniversal, either explicitly or through public posturing, to impede the innovation of new online streaming services by withholding or restricting the use of their content. The Justice Department called dozens of witnesses -- everyone from key employees of rival distributors to AT&T and Time Warner executives -- to bolster its case. The most important witness, though, was economics professor Carl Shapiro from the University of California at Berkeley, who used an economic model to predict that customers would experience a price increase of between $235 million and $561 million overall -- that is, less than a dollar per customer per month. AT&T and Time Warner say the deal is all about competing with "FAANG," an acronym for Facebook, Apple, Amazon, Netflix and Google. 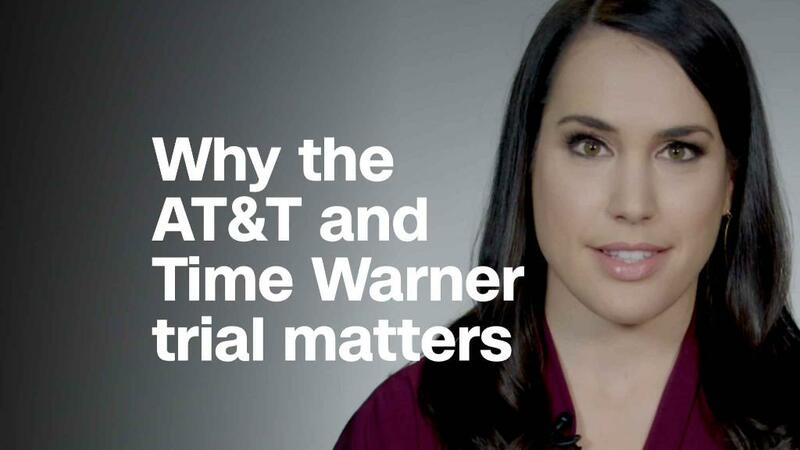 "The vertical integration of AT&T and Time Warner will enable the combined company to respond to the challenges posed by the current transformation of the video marketplace and, in so doing, bring better products and better value to consumers," AT&T and Time Warner attorneys wrote in their post-trial brief. The FAANG companies, AT&T and Time Warner attorneys note, are now deep into the content game. And not only are they creating innovative and popular programs (think "Stranger Things" and "The Marvelous Mrs. Maisel"), they're also gathering reams of data on their customers, allowing them to understand consumer preferences. Time Warner has said it's hobbled by not having information on its viewers. Unlike Netflix, Time Warner doesn't know who exactly is watching what, when and for how long, or what they watch after their favorite shows end. With AT&T, Time Warner says it can have access to that information and will be able to better serve customers by creating the content they want. The companies also claim that this valuable consumer data will also help them sell targeted ads, which could lower consumer's cable bills because the company would need to charge less because they're making more money from ads. Lawyers for AT&T and Time Warner spent time in court on a counterintuitive tactic, trying to argue that Time Warner's content isn't actually as popular as the government says, in an effort to downplay how much distributors actually rely on Time Warner content. The defense also spent a considerable amount of time during the trial trying to cast doubt on Professor Shapiro's study, on everything from the data and model he used to the actual results he found. Even if the data and model were correct, AT&T and Time Warner's attorneys said, the result was statistically insignificant and claimed Shapiro could not prove it would actually happen. Most importantly, the idea that the newly merged company would ever follow through on the threat to withhold its content is "absurd," the attorneys for AT&T and Time Warner wrote in their post-trial brief, because the company would not be able to "financially tolerate the loss of programming deals and so cannot wield a serious threat of walking away from the table." Losing programming deals with a distributor, even for one month, would cost the company hundreds of millions of dollars in lost subscriber fees and advertiser deals, they said.